To get you the peace of mind, you need to secure yourself, your home and your personal belongings. Yale Digital Door Locks take care of this so that you can enjoy your life without worries. In these products we have combined our long experience in making secure and reliable locks with the latest technology for convenience and safety. Yale YDG 323G is specially designed for GATE DOOR. The included Remote control provides full convenience of controlling the Yale Digital Door Lock at main door. Yale YDG 323G has two access solutions from outside, PIN Code or RF card key for your convenience. Once you lose your Card key, it has no validation as long as you re-register rest of your Card keys. When there’s fire, it detects the temperature of the inside. It not only goes off an alarm but also releases the lock status automatically. The remove control and antenna module is included in the package. 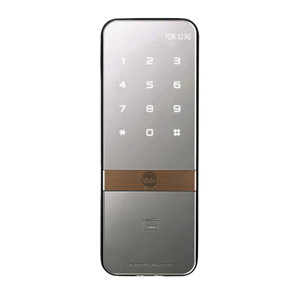 For peace of mind, the system supports Wireless Floating ID technology and it works up 50 m.
For emergency, it can also be unlocked with a mechanical key from inside the house.